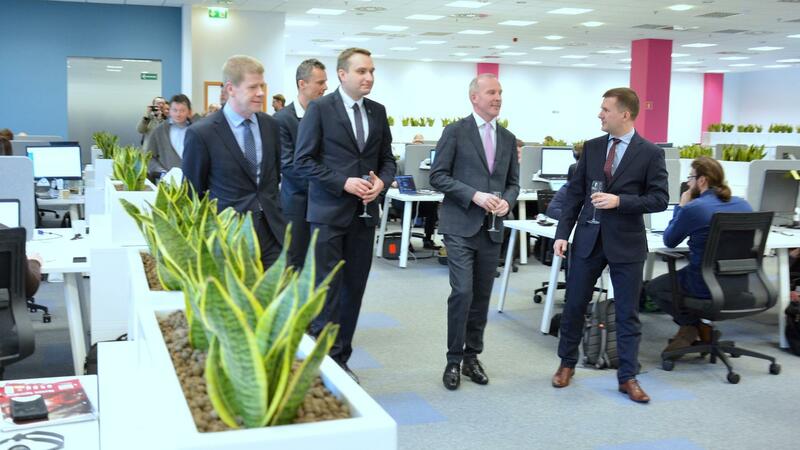 Yesterday marked the official opening of Sonalake’s new Polish offices in the Poznan Financial Centre. Located just a few minutes’ walk from the Old Town, and directly across from the iconic Stary Browar with dozens of lunch and shopping options nearby, the 14-storey Financial Centre is a central hub for technology and commerce in Poznan. The ribbon was cut by Irish Ambassador to Poland, Gerard Keown, and Deputy Mayor of Poznan, Mariusz Wisniewski, who both welcomed the move alongside an investment announcement of an additional 100 high skilled jobs for the city. The event attracted widespread news coverage on national TV and across the technology press. The new office comprises a large, open-plan work area where development teams work in clusters on a wide variety of projects, while 5 meeting rooms of varying size offer space for private calls, brainstorming sessions or more formal client meetings. The team has been settling in well to their new surroundings, with the more central location and improved facilities drawing praise. Having spent 6 happy years at Green Point, the move was necessary to facilitate recent growth at Sonalake which brought current numbers to 70 in Poznan alone, and 95 across the entire company. The new office caters for up to 120 people, and its projected maximum capacity will be reached within 2 years. Both Danu and Verax had a proud history of promoting diverse and progressive workplaces and this ethos was carried forward to Sonalake when the companies merged, with no fewer than 10 nationalities currently represented. We also acknowledge the gender gap that exists in the technology sector and actively try to address it. In Poznan, we are looking primarily for software developers with all levels of experience, test automation engineers and dynamic team leaders. The new office will be more than a business workplace, with opportunities for developer communities and meetup groups to use the space to work on and discuss the latest technologies. We’re excited to grow our teams and fill these roles, so if interested please write to us careers@sonalake.com and visit our careers page.